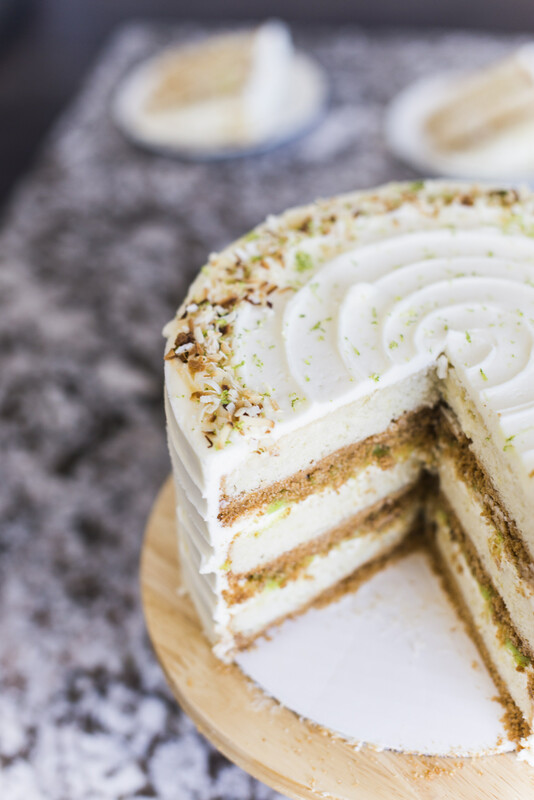 Coconut Key Lime Pie Cake: Layers of toasted graham cracker, coconut lime cake, coconut buttercream, key lime curd and toasted coconut. First off, let me apologize for taking so long to get this recipe up! I wanted it to be the first post on my new website, which I thought would be ready to launch last week, but it took a little longer than expected to work out a few glitches. The idea for this cake came from my stepdad. He is the biggest fan of key lime pie I have ever met. 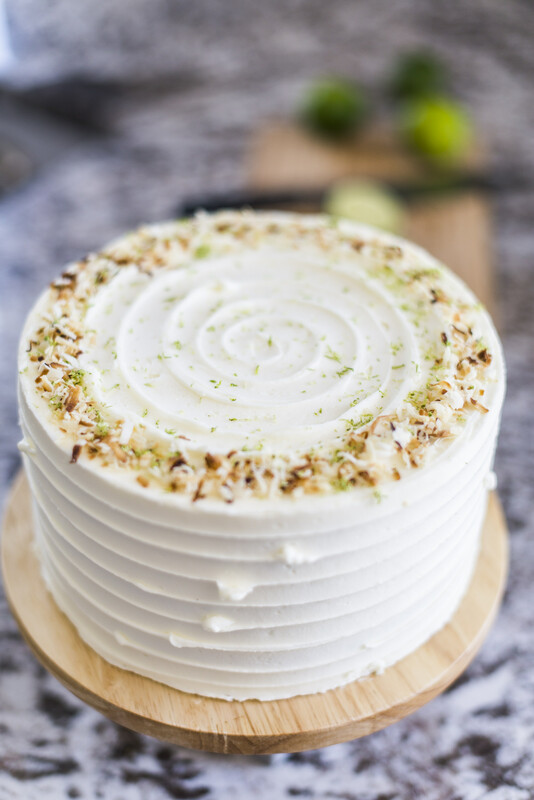 For months now, he’s been begging me to do a key lime cake, but I keep putting it at the bottom of my cake list because the flavor didn’t really speak to me (probably because it’s a pie flavor and pie isn’t really my cup of tea, as you know). But as I started to think about this flavor, I realized the reason I was hesitating to make this particular cake was because I couldn’t figure out what I wanted in it. Then, just a few weeks ago I was at Porcupine Grill in Salt Lake with my mom and stepdad, and per usual, Garry ordered the key lime pie for dessert. I took a bite to see if his love of the dessert had rubbed off on me at all. 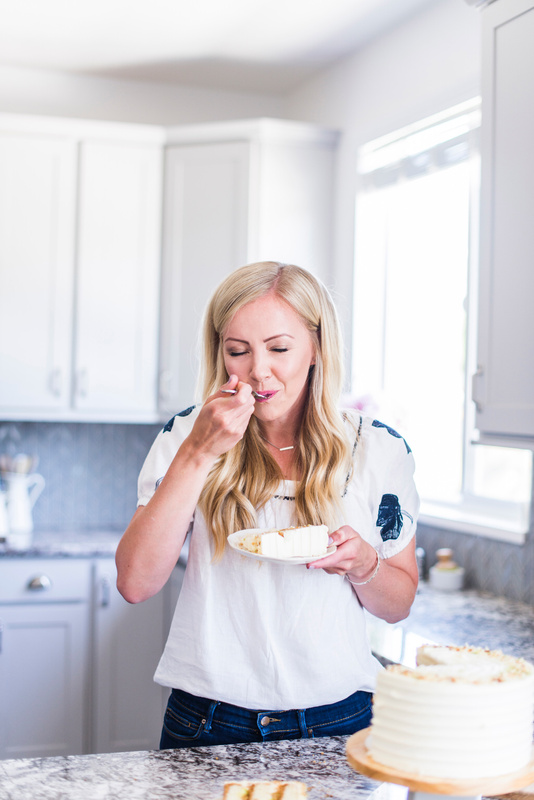 And while I didn’t suddenly love key lime pie, this bite did turn a light bulb on in my head! The cake itself didn’t need to be lime flavored like I was originally stuck on. This cake just needed a lime element to it. Something with a real lime flavor like you get from the custard in the pie. It also occurred to me that I definitely needed a graham cracker crust. The one element of the pie I decided not to throw into the cake was the meringue topping. It’s too airy and flavorless for a cake, in my opinion. So without the meringue element, I started to brainstorm other flavor combinations and quickly settled on coconut as the companion to the key lime. With coconut and graham cracker crust in the mix, I was ready to make this cake. The graham cracker crust is the same one I use for my Ultimate S’mores Cake and bakes beautifully with the moist and tender coconut cream cake on top. I also did a coconut buttercream that I flavored with coconut emulsion for a soft, creamy coconut flavor. The tart key lime curd in between each layer provides a nice balance to all the sweetness in the buttercream and cake. 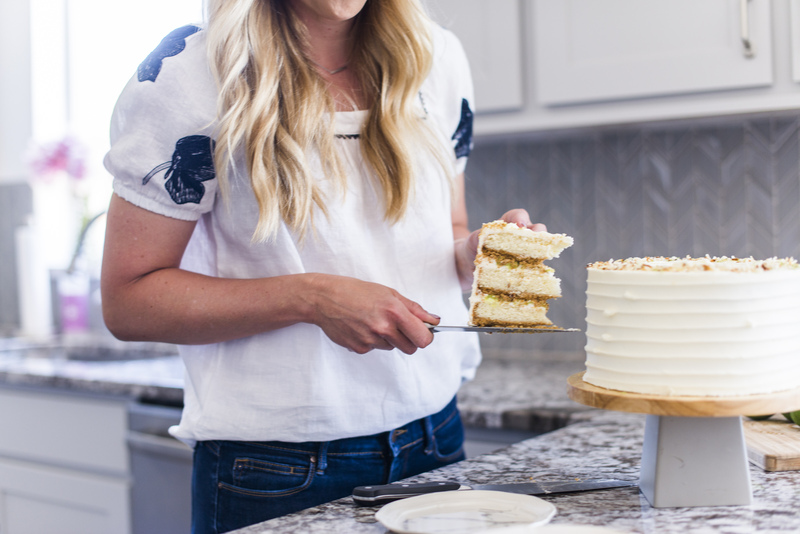 I also decided to throw in some toasted coconut – simply because I love different textures in my cake. Just take a look at all those scrumptious layers! After finishing the cake, I was excited to get my hands on the scraps and create a sample piece for myself. I’ll be honest, I was hoping to at least like it, but didn’t expect to love it… but you guys, I seriously died over this cake! I couldn’t stop eating it and literally danced around my kitchen I was so excited about this cake! The cake layers are moist, the curd is subtly tart, the buttercream is incredibly silky, and the graham cracker crust and toasted coconut are the perfect accents to this pie turned cake! And thank you to Trina Harris Photography for these amazing pictures. 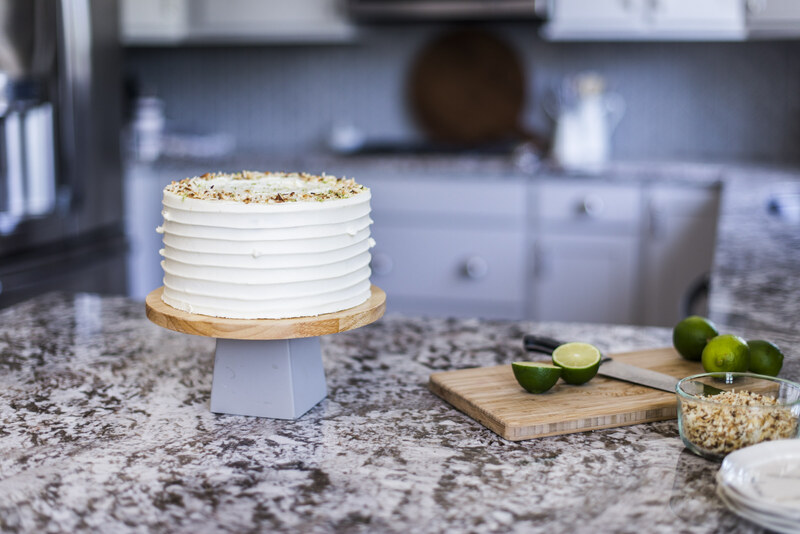 Layers of toasted graham cracker, coconut lime cake, coconut buttercream, key lime curd and toasted coconut. In a small sauce pan, combine the sugar, lime juice, and lime zest over medium heat. Stir until the sugar is dissolved. Add the egg yolks and whole eggs, stirring while you add them. Continue to stir while the mixture cooks for about 5 to 6 minutes. The mixture will thicken during this time. Remove it from the heat and add the butter. Stir until smooth. Run the curd through a fine mesh sieve. Once cooled, place plastic wrap directly on top of the curd and refrigerate for at least 4 hours. In a medium sized bowl combine the graham cracker crumbs, melted butter and sugar. Stir until all the graham cracker crumbs are damped by the melted butter. Bake for 8-10 minutes, until golden brown. 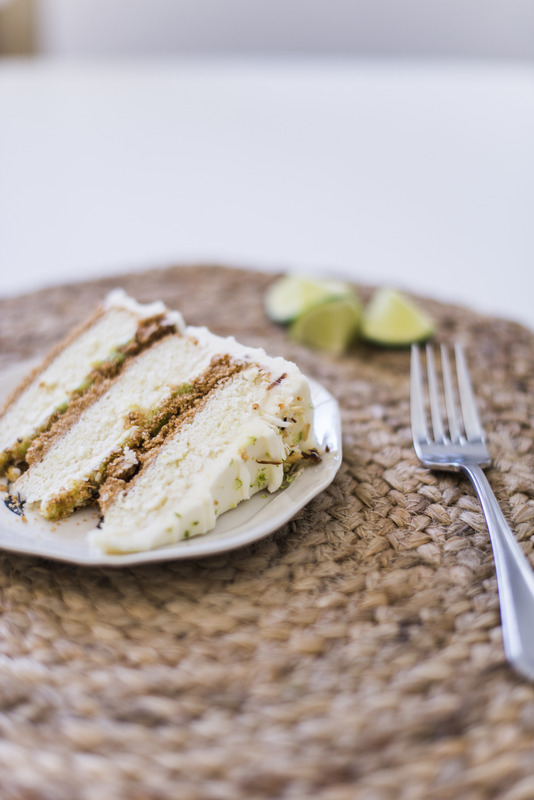 Let cool while you make the coconut lime cake. In a medium sized bowl or large measuring cup, add the whole egg, egg whites, coconut cream, coconut oil, coconut extract, and vanilla extract and beat with a fork until combined. Set aside. In the bowl of a stand mixer fitted with the paddle attachment, sift the cake flour, sugar, baking powder, lime zest and salt. Turn the mixer to low speed and gradually add half of the liquid mixture. Increase the speed to medium and beat for about 1 minute. Turn the mixer off and scrape down the sides of the bowl. With the mixer on medium-low, add the remaining liquid and beat for 30 seconds. Batter will be thick. Evenly distribute the batter over the graham cracker layers in the three pans and level with an offset spatula. Bake for about 25-28 minutes, or until the tops are slightly golden brown and the edges of the cake start to pull away from the sides of the pan. Don't turn off your oven. Let cool in pans for 10 minutes and then invert onto cooling racks to cool completely. Line a baking sheet with parchment paper and evenly spread the shredded coconut across the pan in one layer. Toast the coconut in the oven for about 10 minutes, checking and stirring every 2 to 3 minutes, until the coconut is golden brown all over. Let cool completely before use. In a stand mixer fitted with a paddle attachment, combine the butter and coconut cream. Beat on medium-high speed for 1 to 2 minutes, until light and fluffy. With the mixer on low speed, gradually add the sifted powdered sugar, followed by the extracts and salt. Turn the mixer to medium speed and beat the frosting until it is light and fluffy, about 2 to 3 minutes. Use a wooden spoon to stir out air bubbles. 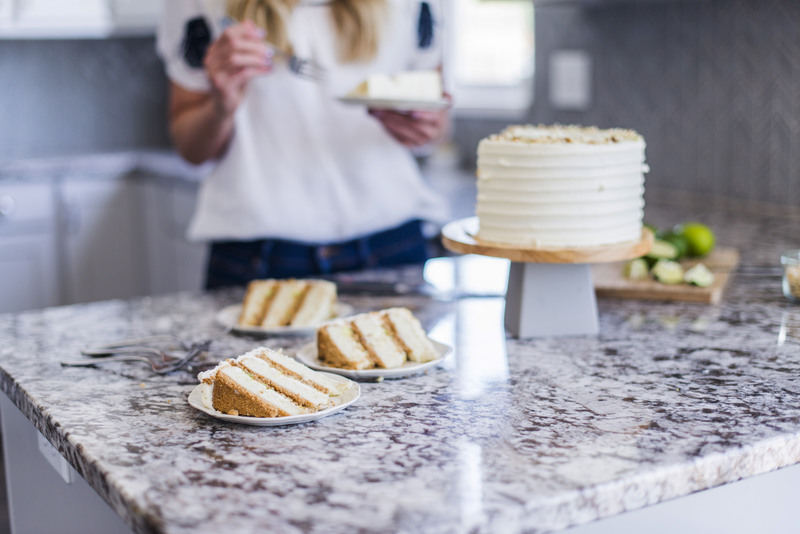 Level each cake layer with a knife or cake leveler. Place your first cake layer, right-side up, on a cake plate or cake board. Cover the cake layer with frosting, allowing some of the frosting to go over the edge of the cake, and then pipe a rim around the cake to act as a barrier to the lime curd. Pour and spread about 3 to 4 tablespoons of lime curd. Cover with toasted coconut. Repeat step 2 and 3 for the second layer, and then place the final cake layer on top, top side up as well. Frost the entire cake with a thin coat of frosting to lock in the crumbs. Freeze the crumb coat for 10 minutes. 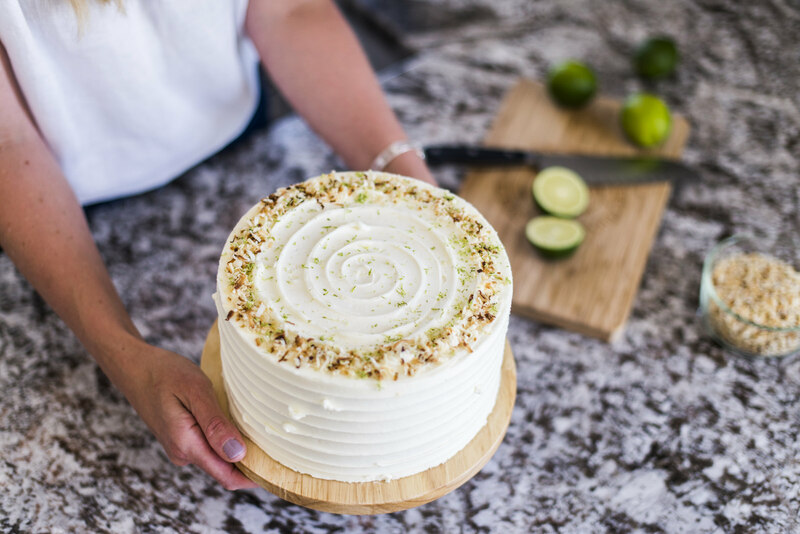 After the crumb coat is chilled, continue frosting the cake and decorate with toasted coconut and lime zest. 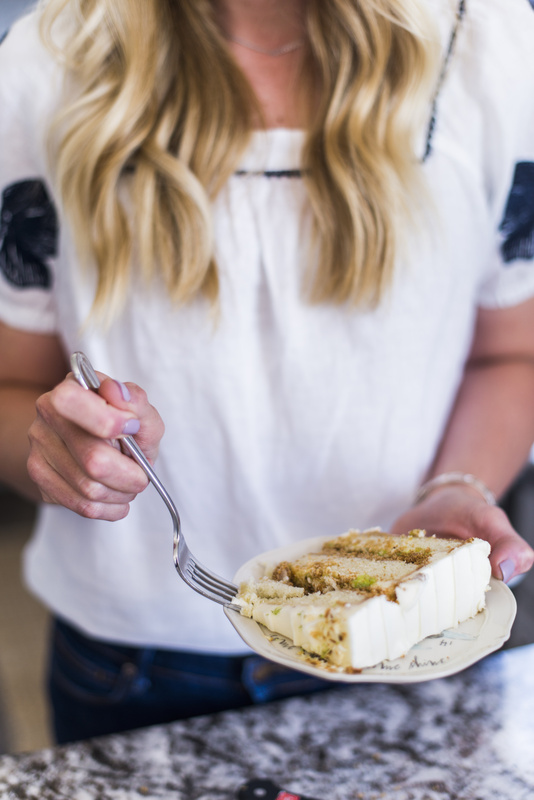 LOVE THIS POST, LOVE THIS CAKE AND I LOVE YOUR NEW WEBSITE! ITS BEAUTIFUL! For the coconut lime cake there is no lime in the recipe? Yes, there is sorry! Just revised it! I’m probably just missing something, but in the assembly stage, I’m not seeing where to put the graham layer? Thanks for you help. You actually just keep the graham cracker layer in the pans after you bake it and then pour the batter on top of it to bake. I just made the lime curd, but I didn’t see in the instructions when I was supposed to put the LorAnn key lime flavor in. I just put it in when I added the eggs. I hope that was ok! I can’t wait to finish this cake! Yes it is. Sorry about that miss on my part! OMG! I can’t wait to dig a fork into this beauty! Just an observation for you though…Your instructions say to put the final layer of cake, top side down. This would put the graham cracker crust at the very top of the cake, which could be very crumbly to frost. In looking at your pictures, I see that you put all 3 cake layers, top side up. This makes more sense for frosting. Thank you! I need to correct that. I finally made this cake to sell at an event… which means I didn’t get to eat it… but the scraps were DELICIOUS! So addicting. Can’t wait to make it again all for me! 🙂 Thanks for the amazing recipe! Oh yes, you have to make it again so you can try it! It’s so good! This cake looks amazing! I am going to make it for my moms birthday but i am trying to figure out how i can make it 2 days ahead of time. Should i make the cake up to the crumb frosting level and keep frozen until the day of? I want it to be as fresh as possible. Any tips would be greatly appreciated! I can’t wait to make this! Yes, you can definitely make it all the way through the crumb coat or even do the entire thing. When you’re done, freeze it for 30 minutes to set the frosting and then wrap the entire thing in plastic wrap to freeze until the night before the party. Move to the fridge overnight and then room temp without the plastic wrap in the mid morning. Hi Courtney! Your site is lovely. You are so talented. Just curious…what type of cream of coconut do you use. The link doesn’t seem to be working. If its similar to Grace cream coconut, do you grate it in the batter? Please confirm. Thanks so much! Sorry about that. The cream of coconut I use comes in a bottle and can be found in the alcohol aisle at the grocery store. Does the butter need to be softened in the cake portion? I made this last night and they baked flat and I’m thinking it’s because my butter was very room temperature? I really try not to over mix so I’m thinking it was the butter? Yes, softened butter is best. If you try it again, maybe even use my new coconut cake recipe for that portion. I think I’ll update it on the key lime pie cake too. I was wondering what coconut emulsion is? And where can we get the lime flavoring? Coconut emulsion is like an extract but creamier, and without the alcohol content. You can get lime flavoring at most grocery stores.